Educational Qualification: 1. A Masters Degree Acadermic. 2. Vide experience in Aclministration and having leadership qualities. 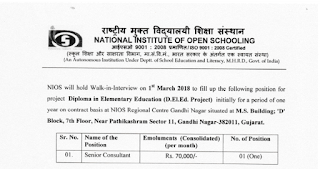 How to Apply: All desirous candidates may attend Walk-in-interview on the date of interview to be held on 1″ March’ 2018 at 11:00 am. onwards with their complete applications giving details of i) Name ii) Date of Birth (age) iii) Address with contract No. iv) Experience vi) Recent passport size plrotograph to be affixed, etc. supported with attested copies of testimonials etc. 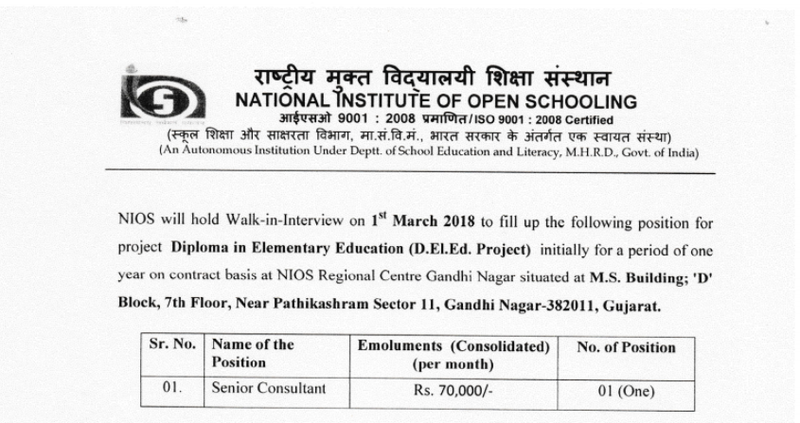 in the prescribed Proforma’ candidate should bring the original testimonial also for verification The registration of the candidates shall be from 9.30 A.M. to 11.00 A.M. on 1st March, 2018′ Walk-In-Interview shall be held at Regional centre Gandhi Nagar situated at M’S’ Building;’D’Block, 7th Floor, Near pathikashram Seclor 11,Gandhi Nagar-382011, Gujarat. Registration Time: 09.30 a.m. to 11.00 a.m.